Oh, toast is coloured brown. Oh, mud is coloured brown. Oh bark of tree is coloured brown. Oh, seeds are coloured brown. Oh, teddy bear is coloured brown. Oh, chocolates are coloured brown. As a part of the colour day celebrations in Nursery section of Witty World celebrated, “Brown Colour Day” on Monday,25 July 2016. Children and teachers came dressed in brown colour clothes. Classroom was decorated with brown colour objects.Children were surprised to see the magic of mixing two colours ‘Blue and Red ‘to get a new colour ‘Brown’ out of it. 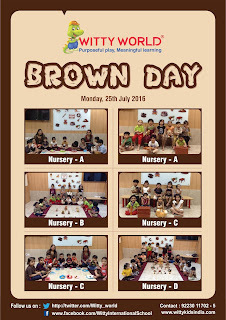 Children enjoyed brown day visuals and had a fun filled day.